Our team of designer-makers are experienced in designing and making a wide range of products for the home and garden, restaurants, shops, offices and many other buildings in both the public and commercial sector. We can design and make products for you combining Scottish hardwoods with a range of other materials. Our working methods are rigorous, responsible and flexible. We can either work to your own design specifications or produce a finished design for you. Our client base has grown since 1996 to include architects, garden designers, house builders working on private, public or corporate projects. We have a reputation for delivering on time and within budget – imaginatively, respectfully and discretely with a dose of humour as well. It’s a young energetic team with a broad experience of working practice and materials. We have our own sawmill and kiln facilities, that way we have unique control of our chain of supply. We stock a wide range of Scottish hardwoods and selected softwoods all from sustainably managed woodlands. 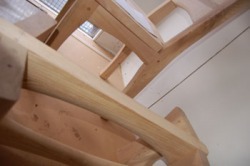 We can provide a bespoke service, cutting timber to various lengths and thicknesses for both internal and external use. We have supplied for historic restoration, landscaping, and extensive private and corporate build. Our work can be seen in castles, cathedrals, public spaces and parliaments.